This section explains procedure for designing an AC/DC conversion circuit and provides an overview so that you can design the circuit with a good understanding of the sequence in which various steps must be executed by verifying each step. You may have a solid understanding of circuit diagrams. Any work involving tasks other than drawing charts and any specific procedure that must be followed, however, must be learned by “doing it.” In addition, skills based on experience and the ability to make proper judgement are also a part of critical assets. Making a product requires an approach in which theory, knowledge, and experience complement one another and are brought to bear on a given task synergistically. 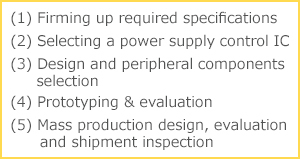 First, you need to decide on design specifications, select an IC that meets those specifications, and proceed with the design task while choosing the various parts that may be required. The design process requires not only the design of the circuits, but also the design of a board layout. After that, prototyping and evaluation are conducted, followed by mass production. Incidentally, these steps are applicable not only to the design of AC/DC converters but also to the design of other power supply units as well. Here, the second item is listed as “Selecting a power supply control IC,” the reason being that in the design of an on-board power supply, in most cases the circuit design involves the use of a power supply IC, as was noted previously. We believe that the scope of work performed by design engineers varies widely from one company to another depending upon the prevailing conditions. For example, an engineer might be called upon to establish shipping inspection methods and investigate defect issues, tasks which may not be a part of design work proper. These steps, however, represent important feedback items for the design process, and task of launching a product in the marketplace must address all these requirements. ・In the circuit design process, it is the design engineer’s experience level that solves many of the problems. ・In the design of an on-board power supply, a critical issue is the appropriate selection of a power supply IC.